Before the place des Vosges was built, Kings of France used to stay in the Hotel des Tournelles which is located in the heart of Le Marais. Built in 1388 by the Chancellor of France, Pierre d'Orgemont, the mediaeval building was composed of numerous towers which give it its name of "the «Tournelles»". After Pierre d'Orgemont died, the hotel had many owners over the years. First, his son, the Bishop of Paris, inherited the hotel but sold it to the Duc Jean de Berry in 1402. Finally, the Duc swapped the hotel des Tournelles for the hotel de Giac with his nephew Louis of Orléans. 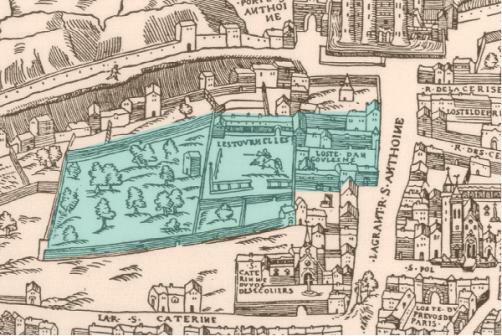 In 1407, Louis of Orléans was murdered and his heirs received the hotel de Tournelles as part of his inheritance. A few years later, due to the death of his wife and one of his sons, along with the imprisonment of his two sons by the British, Louis of Orléans' brother King Charles VI, inherited the hotel de Tournelles. In 1420, thanks to the treaty of Troyes, England had control over France. 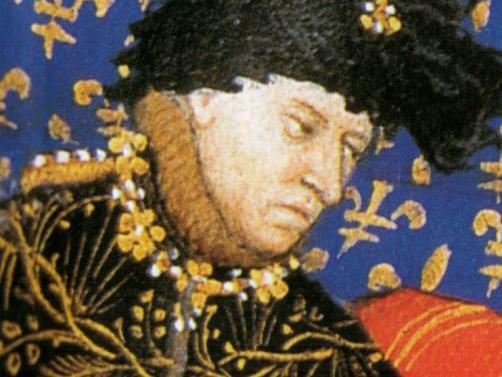 Charles VI died two years later and the Duke of Bedford, Henri V's brother, acquired the hotel. He grew the property by acquiring land from the Saint-Catherine du Val-des-Ecoliers priory. 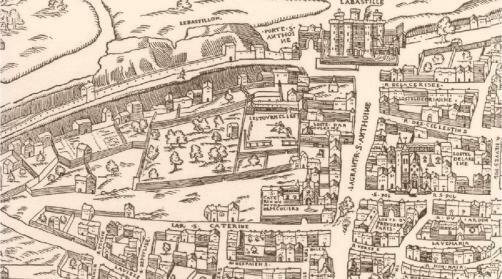 The hotel des Tournelles was extended from the rue Saint-Antoine to the rue Saint-Gilles, and from the rue de Turenne to la rue Jean-Beausire. The property was so vast, it even had gardens with vineyards and an area for growing vegetables. 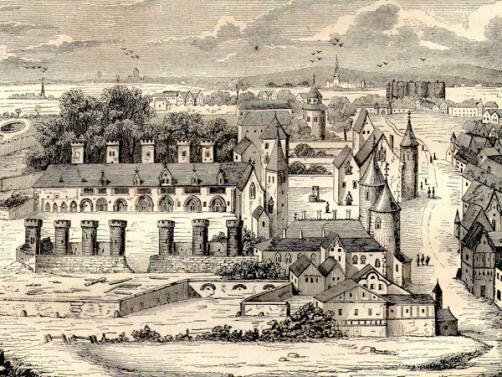 Once the City of Paris was taken away from the British, Charles VII released part of the hotel back to Louis of Orléans' sons in 1441 and 1445. 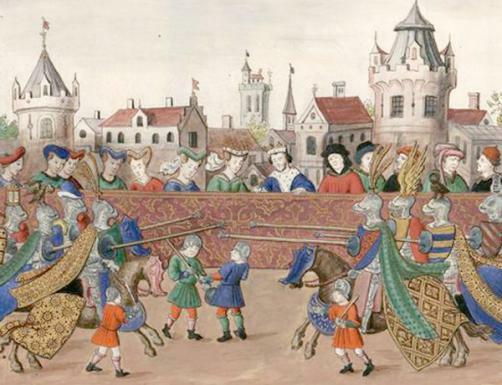 Charles VII kept a part of the hotel under the name the Hôtel du Roi, which was much loved by kings like Charles VIII, Louis XI and Louis XII who liked to spend time in the huge park of the Hôtel des Tournelles for equestrian sports and jousting. It was only once Jean d'Angoulême's son, François 1st, became the King of France that the two parts of the hotel were reunited again. His successor Henri II made many improvements to the royal residence. In April 1559, Henri II and Philippe of Spain signed a treaty of peace in order to put an end to the war between France and Spain. The treaty involved a double-marriage of Elisabeth of France, Henri II's daughter to Philippe II of Spain and Marguerite of France, sister of the French King, with the Duc of Savoie. 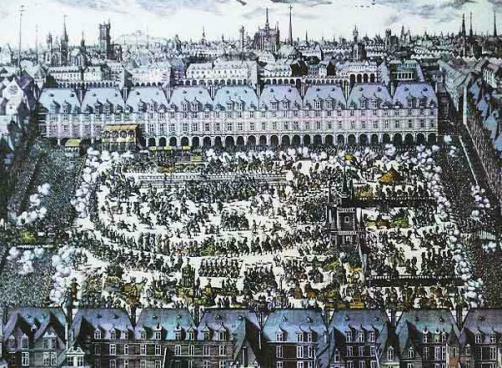 Henri II enjoyed parties and jousting and couldn't wait to organize festivities and games for the celebration in the rue Saint-Antoine, in front of the Hôtel des Tournelles. On the 30th of June, Henri II wanted to participate in the joust, without Catherine of Medicis’ approval as she was scared for her husband's life. 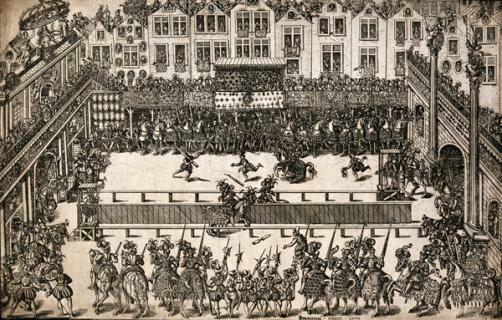 After several successful bouts, Henri II was jousting against count Gabriel of Montgomery when tragedy struck. King Henri was hit in the face with the lance, it pierced his eye and was very badly injured and he was transported to the Hotel des Tournelles to be treated by well-known doctor, Ambroise Paré. 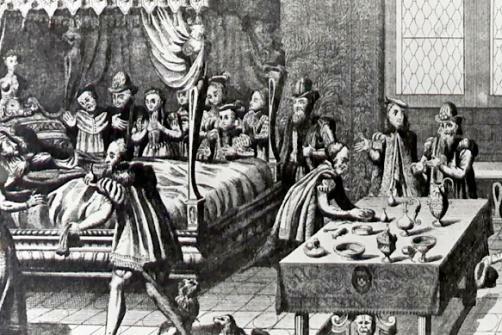 For ten days, the King was in pain, and despite a brief improvement, Henri II died at the age of 41, on the 10th of July 1559; a tragedy which caused the fall of the Hotel des Tournelles. Devastated by the loss of her King, and also because Catherine de Medicis didn't like the medieval style of the Hotel anyway, she decided to leave it with all her memories of Henri II in it. She tried to divide the hotel into plots, which initially became a horse market. 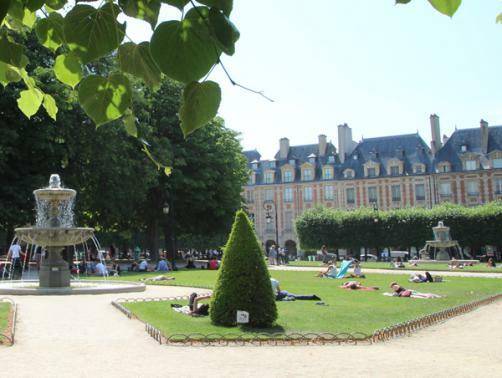 In 1604, under Henri IV’s rules, the Hotel des Tournelles was divided: the south part of the garden became a silk factory, the north part was given the Duc of Sully and the south part of the hotel was turned into a Royal Place, called "Place des Vosges" after the French Revolution. It was unveiled for Louis XIII and Anne d'Autriche's engagement and was used for royal tournaments. 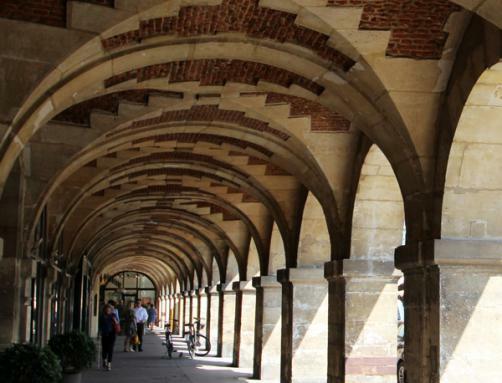 The actual Hotel des Tournelles, just like many other buildings in the area of the old Royal Place has authentic cellars from the 15th and 16th centuries, from the construction of the Place des Vosges. Located in the protected sector of the Marais, the prestigious Place des Vosges, the former chosen place for the aristocracy, has been a listed historical monument since 1954.
le palais des Tournelles n existe plus mais on dit que certaines de ses fondations sont sous la rue des Tournelles, et sous le nord de la place des vosges.